As we prepare to say goodbye to 2016, we’re already looking forward to emerging technology and trends in the graphic design field for 2017. Here’s what we are seeing in the industry, and what you can expect in the coming year. Gone is the rustic, distressed and vintage look. Modern “retro” is reminiscent of newer eras, from the 1970s, 80s and 90s. Pixelated text and homage to the retro technology like the original NES, cassette tapes, and flip phones are common characteristics of this trend, as are the retro patterns and neon colors of the era’s clothing. Mainly used in web design, cinemagraphs are a still image with one or two minor animations. Usually developed and viewed as a .gif, cinemagraphs quickly convey an action when words or multiple images aren’t practical. For a population that now has an attention span that is less than that of a goldfish, cinemagraphs can be a highly effective medium. We’ve been seeing this trend develop for a while now, and for good reason. In line with the shorter attention span of consumers, minimalist graphic design uses fewer focal points, plenty of white space, few words, and rudimentary graphics. It’s the difference between expressing human equality with a single equal sign versus a photograph of a diverse group of people. It creates fewer distractions and forces the consumer to develop their own creative representation in their mind. Graphics that are hand-drawn, or that appear to be hand-drawn, add a human element that can’t be bought with stock photos. They convey the people behind a brand, and are effective at eliciting nostalgia and a reminiscence of childhood in their simplicity. Incredibly popular with web design for young business owners, modular design uses blocks to separate and stack images and text. It is not minimalist in design, but it is also not a long cumbersome block of text. While modular design often requires more scrolling, the visitor is rewarded with more imagery, less “filler” text, and more attention-grabbing details. And, making each block clickable to take the visitor to another page to learn more enhances site navigation while eliminating anchor text links in copy. You likely already have a responsive site, optimized to be viewable on any device. But what about your logo? Simply shrinking it to view on a mobile device doesn’t necessarily provide the best user experience. 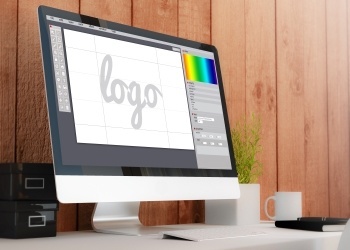 Your logo is a defining part of your brand and should be clearly visible – and clickable – on any device. A responsive logo, like a responsive site, is optimized for visibility on any device. If your graphics are beginning to feel a bit dated and you’re ready for an overhaul, Design & Promote can help! Our graphic designers stay abreast of the latest trends and have a pulse on designs that really work. Design & Promote offers cutting-edge graphic design services to Naperville area businesses. Contact us at 630.995.7109 to learn how we help give your brand a fresh look in the New Year.